Where do you go when you really, really want snow? Specifically, a snowy slope to descend? If you’re in the vicinity of Mt. Morris near Wild Rose, you can always head to Nordic Mountain. Thanks to the winter recreation facility’s newly expanded, state-of-the-art snow-making system, visitors are pretty much guaranteed a snowy surface all season, regardless of any tricks Mother Nature might play. “In the past 15 years we’ve probably tripled our snow-making capabilities,” said Bill Ringenoldus, general manager of Nordic Mountain. These improvements include the addition of 20 automated snow guns that can be swung around to target a specific area with the click of a mouse. Located on Adams-Columbia Electric Cooperative’s lines, Nordic Mountain has 18 ski runs ranging from easy to black diamond level, with 16 lit runs for nighttime skiing. 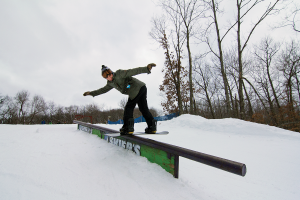 Those runs include three freestyle terrain parks, offering snowboarders of all skill levels a place to perfect their jumps and tricks. Nordic Mountain is known for having some of the best surfaces in the area for skiing, snow tubing, and snowboarding. Photo courtesy of Keith Wohlfert. 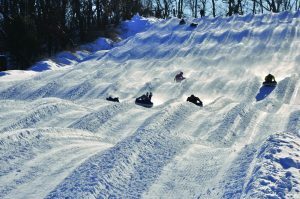 Added in 2006, the snow-tubing park just got even better with recent improvements. The tubing park has 10 chutes, each about four football fields long. The chutes have a 100-foot vertical drop, with rolling bumps built in to make the descent even more thrilling. There’s plenty of time for families to take advantage of all that Nordic Mountain has to offer. Because of the improvements in the snow-making system, the season is longer than ever. Thanks to the dependable snow, any time during the season is a good time for snow lovers to head to Nordic Mountain. However, some special events on the calendar make a trip here even more fun. For example, February 10 and 11 is Winterfest weekend, when guests can partake in some light-hearted activities like limbo contests, tug-of-war pulls, and the facility’s popular cardboard box race. The latter is as much a show as it is a competition; using a cardboard box and duct tape, participants fashion a cardboard sled of sorts and race down the hill. The cardboard “sleds” are judged on looks, originality, and creativity. 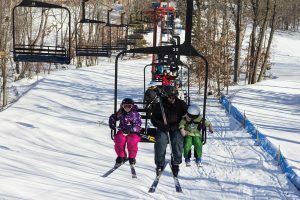 Throughout the season, Nordic Mountain offers various one-day specials with discounts, such as College Night, Boy Scouts Day and Girl Scouts Day, Men’s Night and Ladies Day. The facility also offers special group rates for gatherings such as school organizations, church groups, and birthday parties. Safety First In order to maintain a family-friendly atmosphere, Nordic Mountain emphasizes safety. First-timers are encouraged to book a ski or snowboard lesson with a professional through the Nordic Mountain Snow Sports School before taking to the slopes. Lessons are also available for those who simply want to take their skiing or snowboarding to the next level; online reservations are available and encouraged. Nordic Mountain offers a variety of “Learn To Programs” for children of all ages. 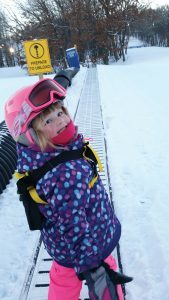 There’s even a Parent and Tot Program for children ages 3 and 4 along with their parents, where the youngest skiers can learn the basics through play-like activities. Nordic Mountain is located at W5806 County Road W, Wild Rose. To learn more, call 920-787-3324 or visit nordicmountain.com.